Welcome to our first intake, Culinary Arts students at our new Melbourne Institute of the Culinary Arts. Our inaugural class of Culinary Arts students were greeted at our new purpose built facilities at Holmesglen Moorabbin on July 9th and 10th to be put through their orientation. Students were welcomed by the Le Cordon Bleu team including Ben Mayne - Manager of Career Services, Karen Spavin - Manager of Admissions and Li Hwan Watt - Registrar. Before beginning studies students were introduced to their Chef’s and teachers and provided with local and regional information about beautiful Melbourne as well as the intricacies of the programs they enrolled in. 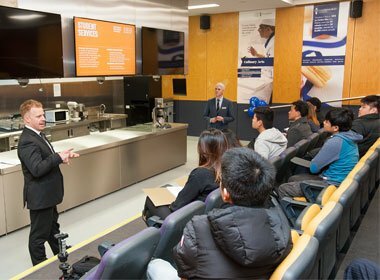 Le Cordon Bleu Australia is very excited to welcome this first cohort of students to the new location and partnership with Holmesglen Moorabbin. Bienvenue!